The most important thing about these three phases is that they are nonlinear (this is also the reason they are represented by shapes instead of numbers. Some learners prefer to begin by discussing and debating, or even observing (square phase) before unguided play or choosing direction. Some might prefer to begin by exploring a particular challenge or path (triangle phase), while exploring the properties of materials along the way. Some prefer to begin by simply touching, testing and playing with materials (circle phase), before discussing and making a plan for a particular challenge to attempt. In an optimal learning situation, the three different phases would all happen, but at different times and in different ways by different learners. This philosophy encourages individual learners to find their own paths within a group. However, the three phases also support social learning in a very strong way, because individual energies of different learners will start to come together through discussion (square phase), joining each other in exploring similar paths (triangle phase), and/or unguided exploration together (circle phase). In this way, both individual and social learning are supported and honored in an organic way. Messing About is a perfect complement to play-based learning. Play-based learning often gets misunderstood as simply letting children (or any age learner) play, and expecting them to learn. Learners do learn a great deal from unguided play (circle phase), but need opportunities to go deeper through the triangle phase and square phase. The beauty of messing about is that it provides a framework for teachers to guide and support play as a means of learning, but also offers freedom and choice to individual learners in how they engage. The role of the teacher is not passive as learners engage in the three phases. The teacher role is rather active, but looks more like facilitation than what most of us would think of as formal instruction. Formal instruction can have a place in Messing About, but should be offered as opportunities arise rather than focused on as a sole method of teaching. Teachers need to have knowledge of subject matter so they can make suggestions, offer ideas and ask questions to provoke learners along the way. Here is the important intersection between Messing About and another of Hawkins’s big ideas: Teachers must be learners of the same subject matter in which they engage their students. If they are not, they simply will not know the possibilities with which to provoke and question learners. We know from research that people learn best when they are able to explore things that interest them but this often gets misunderstood as well. Teachers often say things like: “My children just aren’t interested in learning about gravity…I don’t feel comfortable pushing this on them”. The question is not simply “what are they interested in?”, but should be accompanied by “how are they interested?”. Any learner can be interested in gravity if they have an opportunity to explore it in a way with which they can connect, and that is the true work of teachers…to use close observation and deep understanding of subject matter to identify the ways to encourage and support children’s natural excitement and interest. Check out this fabulous book edited by Chip Donohue! Teachers’ engagement in hands-on learning is particularly critical for learning related to science, mathematics and technology, as these are areas in which many teachers struggle to feel comfortable. I recently had an opportunity to see a presentation by Chip Donohue, a leading thinker in innovative use of technology in education. He is the Dean of Distance Learning and Continuing Education & Director, TEC Center, Erikson Institute and Senior Fellow and Advisor, Fred Rogers Center. In his presentation, he reminded us about many failed attempts to integrate iPads and other types of digital technology into school districts across the United States. This is certainly a matter warranting close investigation for many reasons, but one of the primary reasons the iPads often sit in closets in boxes is because teachers don’t feel comfortable navigating the possibilities they offer. Teachers need to be technological learners, and schools and districts need to invest in professional development to support teachers in this learning. Over the course of my teaching career, I have applied this three-phase cycle in my work with infants, toddlers, preschoolers, school-aged children, and adult learners, and am continually struck by how well it works. Thus, I am currently applying this philosophy to my own learning, which brings me back to coding. I am among the camp of professionals who believes that coding is important to the future of education, and have dedicated space in my personal and professional life to exploring it and chronicling my journeys through this blog. 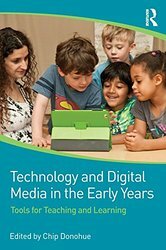 I believe children should not simply be encouraged to consume and use technology, but also to make it! Coding is something that is foreign and even scary to many educators, and that is simply because many of us don’t know what it is all about ourselves. In order to understand the possibilities around bringing meaningful experiences with coding into classrooms, teachers must find ways to connect with it and learn about it themselves. 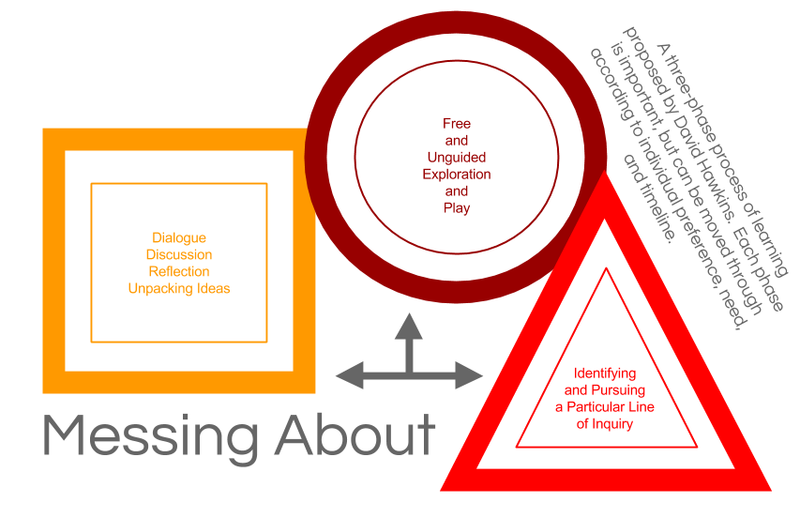 The three phases of Messing About provides a perfect framework through which to explore coding, and so in the name of practicing what I preach, I have been using the Messing About philosophy to engage in my own investigation. Circle Phase: I have been exploring different online learning tools, books, and tutorials to learn about what coding actually is. I have primarily been focusing on tools built for adult learners, but have also learned a lot by playing with Scratch and Logo, two tools built for young learners. Triangle Phase: I decided to try to learn the Ruby programming language in the fall of 2014 as one pathway and am still muddling my way through it. It is important to note that I am not hoping to be able to teach Ruby to children. Rather, I am simply using this pathway to strengthen my own understanding of the fundamentals of programming. Square Phase: I have been using this blog, as well as numerous conversations with other teachers, learners, and programmers, to process and discuss my learning. It is important to note that while I feel that the three phase cycle of Messing About is best practice, my way of engaging in it is not necessarily the best way. One of the connections I have made is with Adriana, an amazing teacher at the University Lake School in Wisconsin, who has been exploring coding herself, though using a much different process. She is a Technology Specialist, and thus works with many different elementary aged children in her role. She is also familiar with the Hawkins’ big ideas, and has been learning about programming in her own way. She started messing about by exploring Scratch and other tools created for children in preparation for Computer Science Education Week back in December 2014. She learned a few things so she could support the children with whom she works (circle phase). She then introduced coding to several groups of students during the 2014 “Hour of Code” celebrations, and was able to support them as they explored freely through their own circle phases. Different groups of students developed different interests through their explorations, and started many different triangle phases. Since December, Adriana has continued to support the students’ triangle phases, as well as her own by learning alongside her students. She has also been engaging in the square phase by discussing the work with students, parents, and other educators. Luckily for me, she has included me in her dialogue, and we have had the opportunity to learn from each other by discussing our different paths to learning to code. The three phases of Messing About can and should intersect many times as one engages in deep and meaningful learning about any subject matter, and you can see how this is happening both in my investigation as well as in Adriana’s and her students’ investigations. Both of our experiences have impacted one another’s, and thus our learning has become stronger and more meaningful. My hope is that through this investigation of coding, I will be better able to conceptualize ways to not only bring coding into my work with children, but also into my work with teachers. I hope to continue to give visibility to the work happening at University Lake School, and also hope to find more colleagues who are interested in sharing visibility of their work through this blog. Does this apply to you? If you are interested in this type of learning, please share a comment! How do you see the three phases of learning happening in your work as a teacher or parent? How are you trying to learn about coding? How are you incorporating coding into your work with learners? By engaging in the square phase together, we can all become more knowledgeable and skillful at teaching and learning in the twenty-first century! Interesting! I will check this out for sure! Thanks for sharing!